We have just returned home from the Spring Leadership meetings and the weather in Louisville seemed more like Winter than Spring. We look forward to the annual Congress in California this Summer and especially the sunny and warm weather there. During our meeting, information regarding the July 2019 Congress was shared by Keitha Callanan wife of the Congress Chairman and Janet Brown, California State President of the Ladies Auxiliary. As I write this, hotel registration is open and the actual Congress registration forms will be available on the SAR website very soon. Remember to sign up for the optional tours which are open to all. They sound wonderful. The Youth Awards Luncheon and two formal banquets are included in your congress registration. The program for the Spring Leadership Ladies Auxiliary meeting was presented by Past President General NSSAR Joseph Dooley and John Murphy, Creative Director from Solid Light, Inc who will be working with NSSAR to complete the SAR Education Center and Museum at the headquarters in Louisville. The First Lady’s Luncheon hosted by Nancy Alter provided such a nice social time to make new friendships and renew the old. The menu featured asparagus soup and a BLT sandwich followed by another of the Brown Hotel’s scrumptious desserts. The luncheon speaker was Sue Kelly Ballard, author of My Blessed, Wretched Life, the story of a ten-year span in the life of Rebecca Boone, wife of Daniel Boone. Following the luncheon, excitement over the items to choose from during the drawings was infectious as our members generously supported SAR and enjoyed choosing from the wide assortment of goodies at the same time. Please remember to bring a basket or item for silent auction to Congress. Of course, checks are always greatly appreciated as well and they are so much easier to pack. We welcome your generous participation to benefit an SAR project from state auxiliaries and individuals. If you have questions regarding donations, please contact 2nd Vice President Linda Wood. As was discussed during our meeting, if you have an SAR project and know of a specific needed area you would like to recommend for our gift this year to SAR, please contact any of the state officers with your vote PRIOR to the meeting in California when the check(s) will be presented. At the end of the Spring Leadership meeting, the nominating committee named the individuals they have chosen as NLASAR officers for the next two years. New officers will be elected during our business meeting at congress and installed at the Tuesday evening banquet. It has been an honor to serve as your president. Thank you for this opportunity to work together while also forming friendships and using our time for worthwhile projects. Ladies gathered together at Fall Leadership in Louisville to again renew friendships and make new friends. The meeting of the executive board was early on Friday prior to the general meeting. At the general meeting, cards signed by members were sent to our two officers who were ill as well as to President General Howard and Nancy Horne in recognition of their 70th Anniversary. During our meeting, David Perkins joined the ladies to thank them for the congress donation to the JROTC Committee. A check in the amount of $200 was presented by Karen Powell from the North Carolina ladies for the library. Keitha Callanan shared details of plans for the next Congress which will be held in California. First Lady Nancy Alter announced her project and sale of pins to benefit the National Disaster Search Dog Foundation. Following the business meeting, a program on baskets of the colonial era was presented by Venie Hinson. She displayed many of her baskets and told us about their use as well as basket construction. On Saturday, ladies boarded buses for the short trip to the Conrad-Caldwell House Museum while the men conducted business. We toured the beautiful architectural landmark known as the Mansion of Louisville followed by a Victorian Tea, hosted by our First Lady. The beautiful woodwork and parquet floors as well as furnishings and fabrics of the home provided ladies with a look at the life of prominent families during the Gilded Age. Following the luncheon, the ladies returned to the hotel for spirited and joyful drawings from an array of donated items. The Friday and Saturday night banquets provided social opportunities to dine with friends in the elegant Brown Hotel Ballroom. The keynote speaker from the Clements Library at University of Michigan shared information regarding the little known library’s special Revolutionary Era holdings as well as history on Ethan Allen from the 18th century. A new Ladies Auxiliary shirt is available for purchase along with NLASAR pins, charms and name tags and ribbons for our pins. 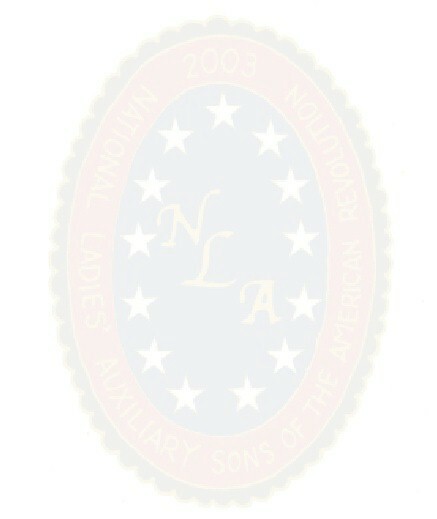 Be sure to take a look at the pictures under the Recent Events heading on the NLASAR.org website as we enjoyed our weekend together. Please join us at Spring Leadership held Feb 26-Mar 2, 2019! We have just returned from Houston and the outstanding Congress. Our Cowboy Hats are off to the Texas Society for hosting this exciting event! Arriving on Thursday evening to attend one of the tours offered beginning on Friday morning, we began our busy week. We toured the NASA Space Center on a tram of the facility, followed by a lunch there and a talk by an outstanding NASA speaker sharing background information not usually seen on the news. The hands-on Space Museum and Center were exciting and informative. The other tour offered that day was a visit to the George W. Bush Library and Presidential site. We were welcomed on Friday Evening by our Texas hosts to a Southwestern style reception at the George Ranch featuring country music, photographs and of course BBQ meats. There were even long horned steers in attendance! Sunday activities included the Memorial Service and the First Lady’s Tea. The Rumbaugh Orations Contest eliminations in the morning and finals in the evening resulted in a first place award to Rebecca Doan from Decatur, Indiana. On Monday, following greetings by dignitaries and the opening ceremonies, the NLASAR board meeting was held in the morning with the usual officer reports and business discussions. Following the Youth Awards Luncheon honoring the special outstanding students including the Eagle Scout Award, JROTC and Essay awards, the Ladies Auxiliary meeting was held with 100 attendees. President General Ann Dillon of National Society Daughters of the American Revolution stopped in to bring special greetings. To support the projects and special committees of SAR, members voted to donate $3,000 each to the JROTC and Knight Essay Operating Funds for student scholarships. The featured speaker was Dr Carolina Crimm who kept the audience engaged with her animated talk on the wife of Bernardo de Galvez and her families. It was easy to see how she excited her students about history. Monday evening was Recognition Night where the new Minute Men and those previously receiving this prestigious award were presented followed by the distribution of state and chapter awards. Tuesday was the NLASAR Ladies Luncheon held at the Houston Junior League, a beautiful facility and our beautiful ladies were decked out in their Sunday best - some with hats for this festive occasion hosted by First Lady Karin Guzy. Kaylin Weber, Curator at the Houston Museum of Fine Arts, was our featured speaker. Following the luncheon, funds were raised by the auctioning of baskets donated by state auxiliaries and individuals as well as drawings for various and sundry keepsakes in the Ladies Hospitality Room in the hotel. The formal and elegant President General’s Banquet was held in the evening. Tours of the Houston Museum District and the San Jacinto Battlefield were offered on Wednesday with the formal President General’s Installation Banquet in the evening bringing to a close the 128th Annual SAR Congress. Please see our Recent Events page for a few pictures. A Texas-sized thank you goes to the Texas ladies who hosted our hospitality room. It was great to meet so many ladies this year as we formed new friendships and renewed friendships from across the country. While enjoying snacks and rest there, we completed thank you notes to active military. If you were unable to attend, please mark your calendar to attend the 129th Congress in Orange County, California next year on 5-10 July, 2019. You won’t want to miss it. Our next meeting is at Fall Leadership in Louisville 27-29 Sept, 2018. We look forward to gathering together again among friends whose interests we share. Happy Spring! As I write this, the daffodils in northern Indiana have just surfaced but there are serious snowstorms, floods and power outages in the North East. We welcome spring, a transition time for many of us as we say goodbye to winter. The Spring Leadership meeting in Louisville was again enjoyed by many as we traveled with our husbands to the meetings. Renewing acquaintances, making new friends and seeing old friends as we gathered at the Thursday evening reception and social time at the Brown Hotel is always enjoyable. Our Ladies Auxiliary meeting on Friday morning was attended by more than 50 ladies. Four state presidents of ladies auxiliaries were introduced as well as three first time attendees. Our program was presented by Kay Anderson who inspired us to learn more about our little known women ancestors. During the meeting, we also learned about details of the upcoming Congress in Houston in July - what to wear, weather, etc. There will be a hospitality room hosted by the Texas Ladies Auxiliary and the First Lady’s Tea. The Ladies Luncheon on Monday requires advance reservations. Ladies are asked to bring baskets for the silent auction fundraisers which are representative of their states for display in the hospitality room prior to the drawings. We invite you to stop in the hospitality room during congress any time and write thank you notes to our active military, work on sewing projects, and to check out the opportunity drawings as we relax together. On Friday evening during Spring Leadership, we enjoyed wearing green – and there were all kinds of green worn from luscious velvet and silk to silly sequins and shamrocks, Irish fare for dinner and an Irish band as we enjoyed social time and pretended we all had Irish ancestors, celebrating an early St Patrick’s Day. The Ladies luncheon on Saturday was special with a particularly yummy dessert and beautiful live tulip table decorations and an interesting program presented by Steve Vest. The Saturday night banquet was a more formal event with an interesting author speaking and signing his books about his historical finds relating to the original 13 colonies. We look forward to traveling to Houston where we will be together again. Please remember to bring a basket representative of your state for our auction benefitting NSSAR. More information about the tours and events will be available soon on the SAR website under the Congress Registration tab, so be sure to watch for it. Please remember too that all ladies are invited to attend the Ladies Auxiliary meetings and special ladies events. If your state does not have a ladies auxiliary, we will help you organize one or you may join the national ladies auxiliary as a member-at-large. The form to renew dues or apply for membership in the national ladies auxiliary is available on this website. If your state already has a state auxiliary, you are automatically a member of the national organization. The gathering of friends at the NLASAR meeting and program as well as the First Lady’s Luncheon during the SAR Fall Leadership meeting becomes a reunion as old friendships are renewed and new members and guests join us. We welcome first time attendees Janie from NV, Lydia from NH, Louanna and Lola from IL, Christie, Ellie and Anne from FL, Maria of TN, Kathy of IN, Karen of MD, Donna from AZ, Marjorie of WV and Dee-Dee of PA. Over 75 members and guests were in attendance for the NLASAR Fall events. The program following the Friday business meeting was presented by Nancy Billings of Alabama as she shared the stories of the lives of her ancestors which she was able to gather from old letters found in a breadbox. These letters provided an insight into their lives and a much deeper understanding of them than what is available to a genealogist only knowing the names and dates found on old census records. The First Lady’s luncheon on Saturday was a special time together as we dressed in our Sunday best and enjoyed the social time over lunch with a fabulous Brown Hotel special dessert which was followed by the program presented by Allan Steinberg, co-founder of the Louisville Historical League of the Louisville. Allan shared interesting history as well as fun facts about Louisville and his quick humor kept us paying close attention. Immediately following the Saturday luncheon, drawings were held for the various donated items on display. It is always exciting as the silent auction contest winners are revealed and the numbers are drawn. We are delighted to choose our special items from the offerings. Be sure to take a look at Mistress Molly and her wardrobe elsewhere on this site. She will be awarded a new home at Congress 2018. A reminder, qualifying members of state societies with current state affiliated auxiliaries are automatically members of the national organization without additional dues and those without a state organization are eligible for national membership. All are encouraged to attend our meetings and events and to join the Ladies Auxiliary. Please plan to attend the Friday NLASAR meeting and program and be sure to register for the Saturday First Lady’s Luncheon as we gather together again for the Leadership Meeting in Louisville on the weekend of March 1-3, 2018. It was great to see so many of you at the Knoxville Congress held in July, 2017! We were pleased to welcome nearly 100 ladies who were present for the Ladies Auxiliary meeting. Many attended the Memorial Service honoring past members followed by the First Lady’s Tea. The Ladies Luncheon at the Cherokee Country Club was held in an awesome facility with to-die-for dessert and beautiful teapot table decorations which became gifts to one lucky lady at each table. The world’s fair city center shopping and restaurant locations, Tennessee welcome Bar-B-Q, optional tours to the Cumberland Gap/Museum of Appalachia, Sycamore Shoals/Amis Mill, and our visit to the Secret City of Oak Ridge & the American Museum of Science and Energy kept us all busy in addition to the luncheons and banquets. A big thank you to Immediate Past President Karen Powell and her board members and helpers for their fund raising efforts which created a gift of $5,000 to the CAAH Fund and $1,000 designated for the NSSAR Youth Awards Programs from the National Ladies Auxiliary during this congress. Tickets for 50/50 funds were sold at the banquets and the many baskets and individual items were donated and offered for auction in the ladies hospitality room. State societies and many ladies offered unusual, fun, beautiful, collectible, edible and/or useful items to be sold to raise these funds for the SAR. It is such fun to attend the luncheon followed by the drawing of names and announcement of winners from the silent auctions in the hospitality room, experiencing together the excitement as the goodies are disbursed. If you have not attended in the past, be sure to do so at the very next opportunity. We look forward to seeing friends, catching up on news and meeting new ladies at Congress each year as well as at the Leadership meetings in Louisville. If you have not joined us in the past, please plan to seek out the schedule for ladies events and join us for fun social events, brief meeting with speakers, service opportunities and establishing and maintaining the warm bonds of friendships. Please join us as we gather together again for the Leadership Meeting in Louisville on the weekend of Sept 28-30, 2017.